Version 2.0 The figshare and HASTAC versions of this post have been updated accordingly. UPDATE Thursday 2 May 2013, 08:48am BST. 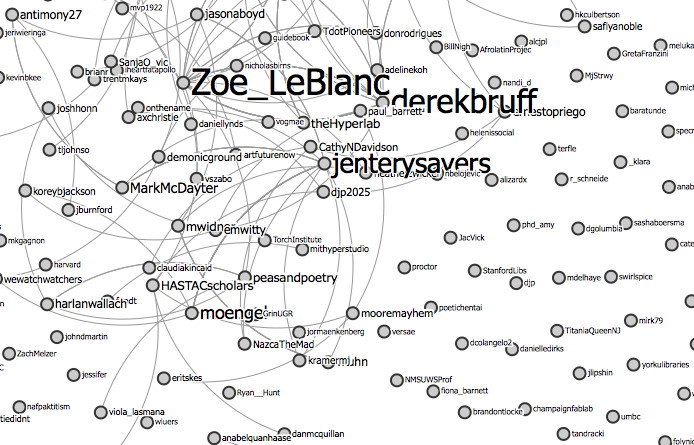 Unfortunately I did not have time to do a new collection increasing the number of tweets to collect. The initial collection used the default 1500, and even though I did it on the Monday morning (BST time) after the conference the archive did not go back enough (it can only go back 7 days). In retrospect I should have aimed to collect more tweets than the default 1500 the first time around, but I was concerned the script would time out. I only found some time this morning to try again (script having timed out when I tried 18,000 tweets, which is the maximum output), and using 17,500 at worked this time, taking me as back as 26/04/13, 08:2243, which is more than 24 hours before my previous collection.The Conference information says activities started on 25/04/13 (Thursday) but as the programme and now both #hastac2013 archives confirm the day with the most activity was 27/04/13 (Saturday). Therefore though this new collection does not go as back as the 25th, at least it covers the day before activity peaked. Where the previous archive had 1500 tweets, this new one gathered 3,898. 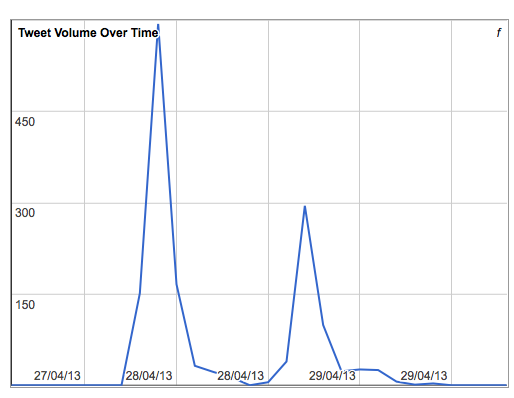 3898 tweets collected, archive started 26/04/13 8:22:43. Archive set up by Ernesto Priego using TAGS. You can see a published interactive archive of this new archive here. I link to the published spreadsheets from the PDF version of this post that can be downloaded from figshare. HASTAC2013 Interactive Archive. Ernesto Priego. figshare. As they describe it themselves, the Humanities, Arts, Science, Technology Advanced Collaboratory (HASTAC – “haystack” hastac.org), is “an organisation at the international forefront of knowledge mobilization for our digital present and innovation in the academy.” I have had the honour to be a HASTAC Scholar blogging at their site since 2010. 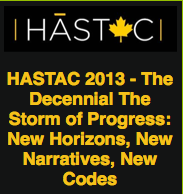 2013 marks the 10th anniversary of HASTAC’s founding, and on 25th-28th April they celebrated their decennial conference, titled “The Storm of Progress: New Horizons, New Narratives, New Codes”, in Toronto, Canada. 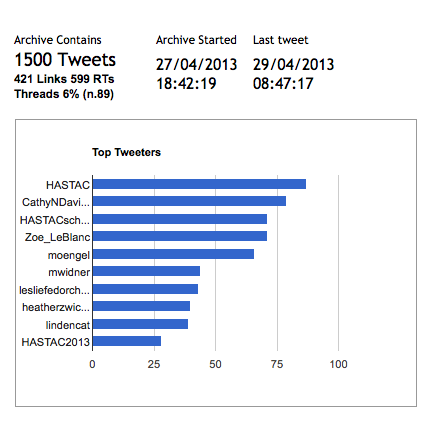 [I have done an intial archive covering only the latest (at the time of publishing) 1500 tweets, as high values may no work due to script timeouts, but I am currently experimenting trying to get the majority of the #hastac2013 output. Will update accordingly. Times from my archiving are GMT]. 1500 tweets, 599 RTs, 421 links. Archive started by Ernesto Priego 27/04/2013 18:42:19 GMT. As usual, with many thanks to Martin Hawksey.